Is your site speed costing you visitors? 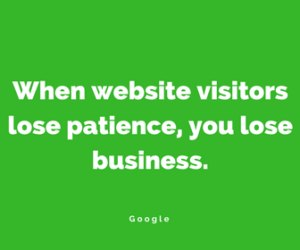 One out of two visitors expects your mobile site to load within a couple of seconds. To keep more potential customers, visit the Google Test My Site and get a free report with specific ways to improve your speed and results. Test your site and see how your site is performing. If its time for an update we can help. Our custom sites are fully responsive and look great on mobiles, desktops and tablets. They are super fast. Moreover, on top of that, we are here to make changes and keep it right up-to-date for you. We work on an all-inclusive subscription basis which includes development, hosting and support. No big development fees! Please email or call 0116 2160293 for more details.